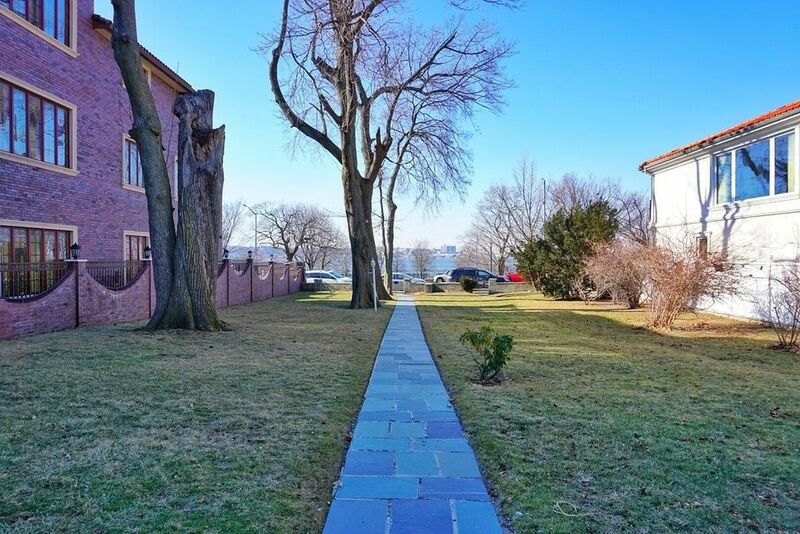 Two houses on Shore Road may be the oldest surviving buildings in the neighborhood—but they’re presently for sale, and the real estate company has suggested they could be torn down: “The possibilities are incredible for a Shore Road home with harbor view,” according to REMAX Elite. 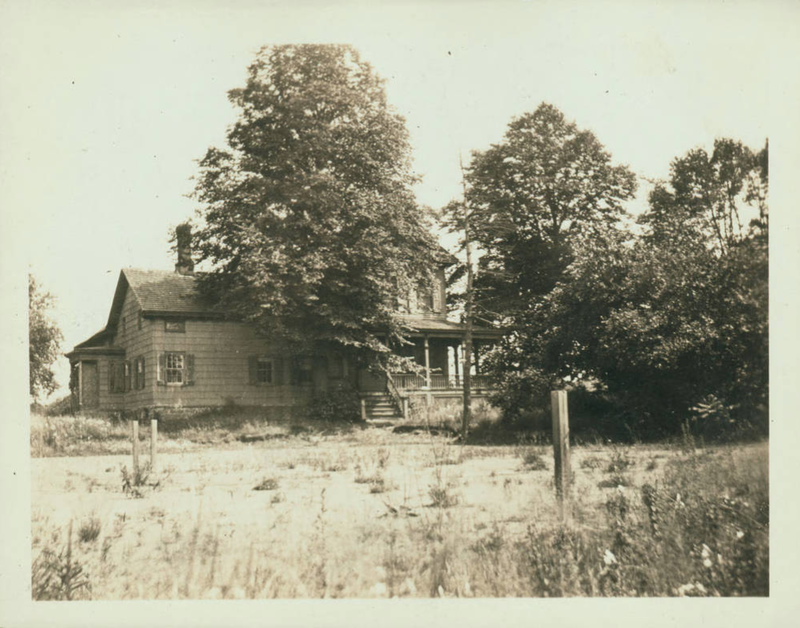 7535 Shore Road and 7539 Shore Road are attached, once (as far as I can tell) part of the same homestead; when they were separated is unclear. The two homes are about 160 feet from the street, much farther back than any other house on Shore Road, reached by a straight stone path, past several old-growth trees. 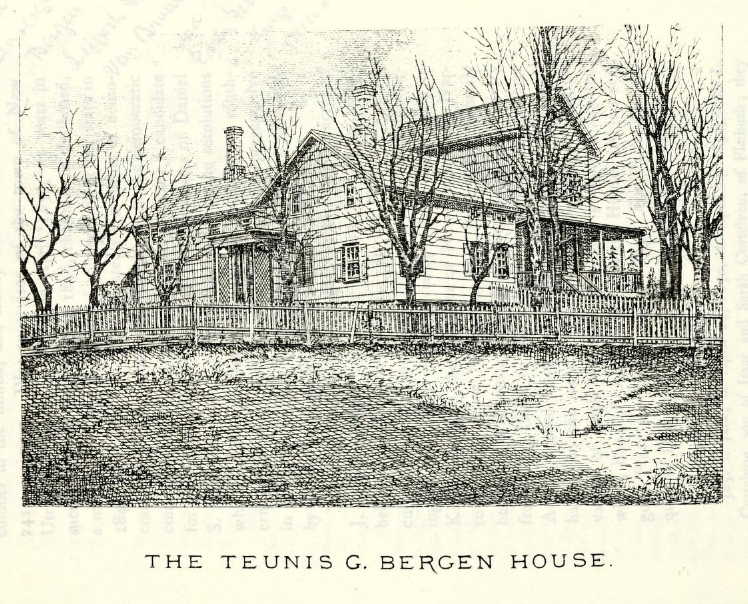 The homes were once on land belonging to Teunis G. Bergen (1806–1881), a descendant of one of the oldest families in this part of present-day Brooklyn—and one of the “great men” in Bay Ridge history. 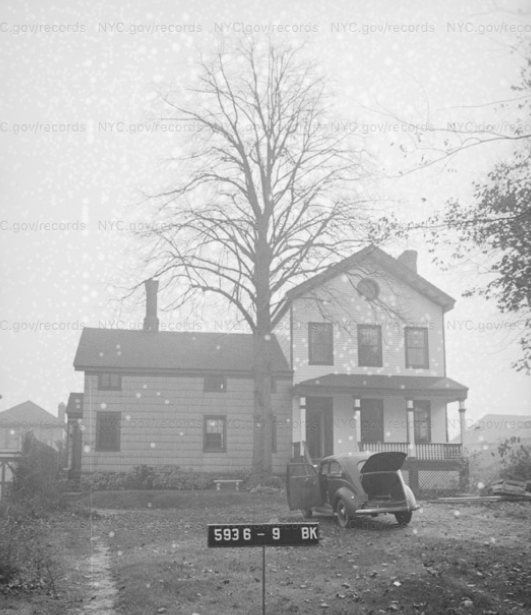 A surveyor in the town of New Utrecht (of which the village of Bay Ridge was a part, before New Utrecht joined the city of Brooklyn in 1894), Teunis was also our first local historian; he cofounded the Long Island Historical Society (which became the Brooklyn Historical Society) and “devoted his leisure hours to antiquarian and genealogical researches, which ran most naturally in the lines of Dutch ancestry and the history of Kings County,” the Brooklyn Eagle reported in 1918. 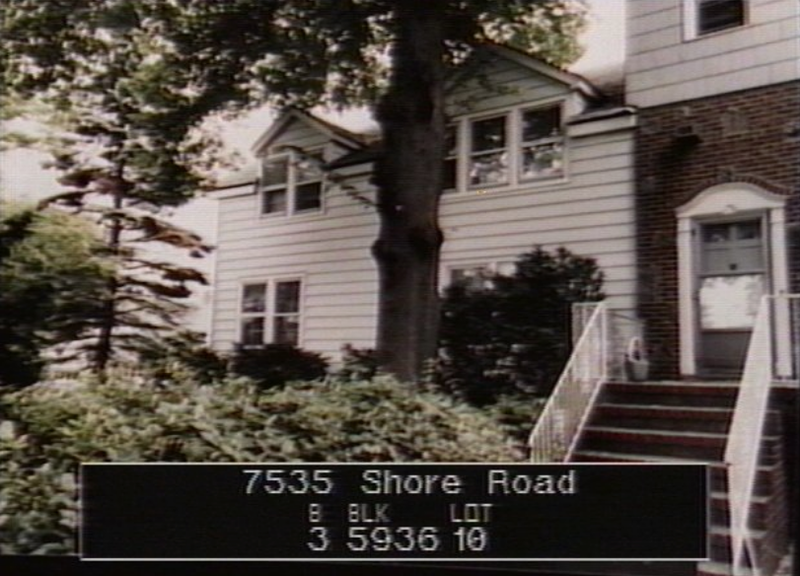 The still-standing house is just south of where 76th Street would be, if it cut through to Shore Road. 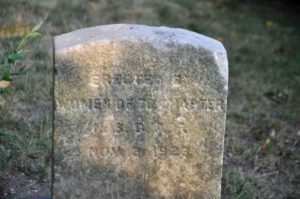 Teunis’s father had bought the house and land from Henry Aldworth—a coal dealer who moved to Williamsburg and wrote a book “against the Bible”—on October 31, 1828, for $5,320. Teunis moved there the following year. The house may have been built around the turn of the 19th century, as suggested by an Eagle article from 1942, which reports on a curious real estate deal, which packaged 7539 Shore Road with 7543 Shore Road (its neighbor to the south, still standing), “one built four years ago and the other built 150 years ago” (emphasis mine). 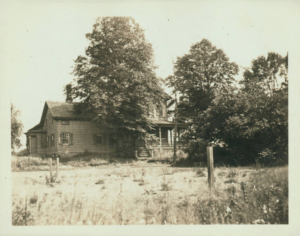 Today perhaps the oldest of Shore Road homes is the Bergen homestead…Its occupant is Captain William Drechsel…When the captain decided to move to Brooklyn in 1929 he asked a real estate agent to find him a shorefront home surrounded by gardens and trees. “I have just the place,” the agent said. “Is it an old house?” Captain Drechsel asked. The agent hesitated, and finally replied in the negative. After Captain Drechsel had looked the place over, noting the old style construction, the heavy beams and the wide-board floors, he questioned the agent. The building is now 171 years old [meaning it was built in 1764]. 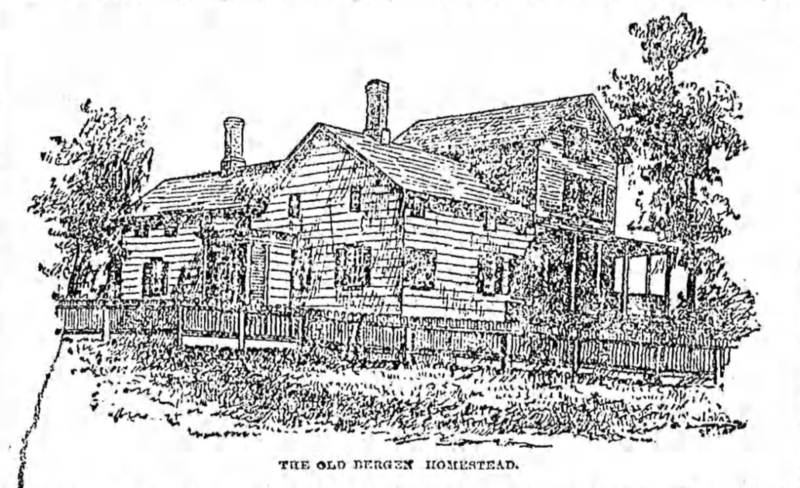 In comparison, the most notable old Bay Ridge home, the landmarked Farrell House on 95th Street, dates from the 1840s. 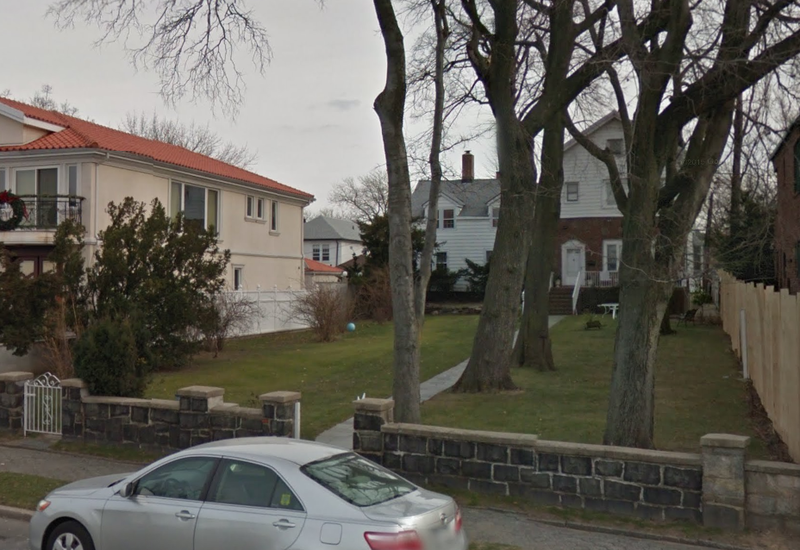 It’s impossible for us to say that 7535–39 Shore Road is the oldest house in Bay Ridge without doing a house-by-house study (and more research into the particulars of this one), but it’s a very strong contender. 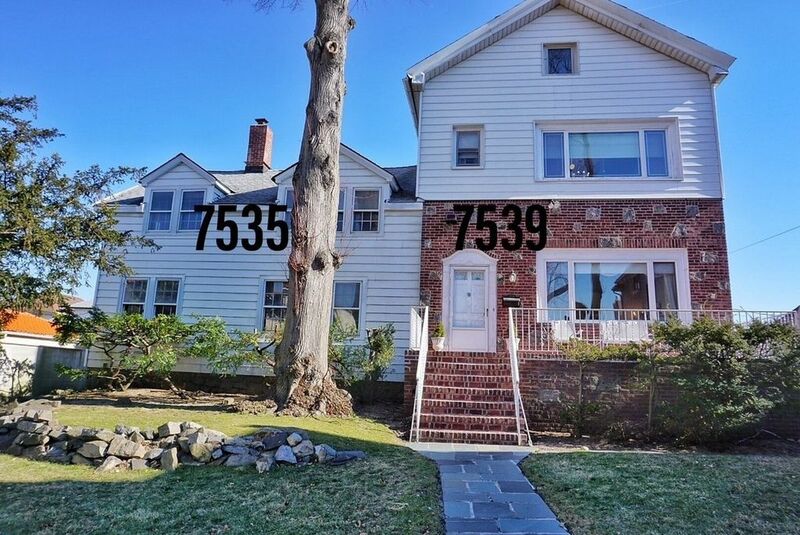 Today, 7539 Shore Road is being packaged in a real estate deal with its neighbor to the north, 7535 Shore Road, once one building but at some point, apparently, divided into two distinct homes. 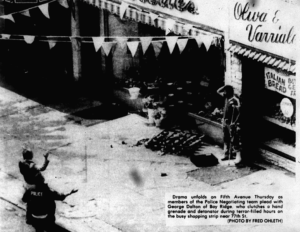 (The latter is accessed now by the building’s old side/kitchen entrance.) It’s also conceivable, for example, that what’s now No. 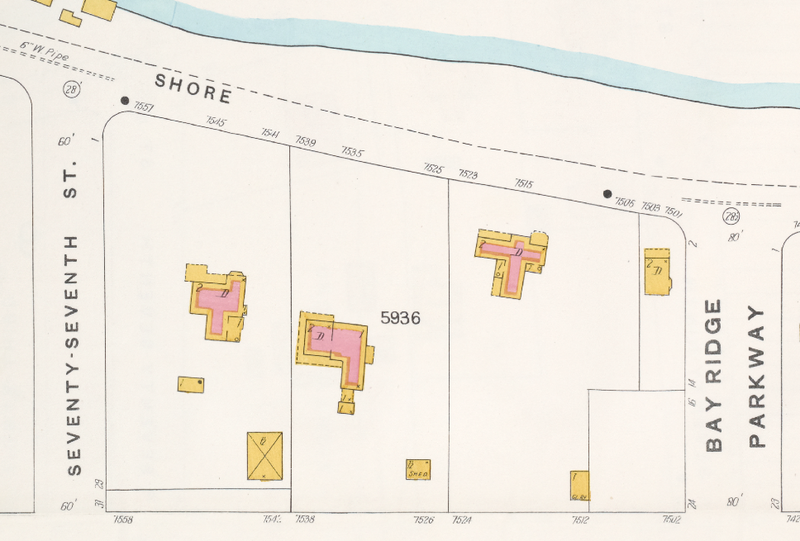 7539 was the original Aldworth house, and Teunis added what’s now No. 7535 to it later. (The table of contents of the Teunis Bergen archive lists a folder about the enlargement of his house.) 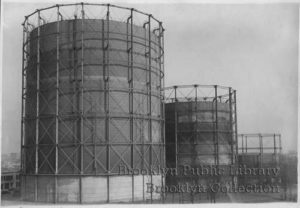 The exteriors have been obviously modernized and changed; alterations to the structures were made, according to the department of buildings, as recently as 1941, 1956 and 1968. “It is modern looking from the outside but old inside,” one local, who once toured the interior, tells us. They’re priced at $2.3 million each but must be sold together, according to the real estate listing, putting the actual price at $4.6 million, for 12,500 square feet. The plot is zoned R4A, “characterized by houses with two stories and an attic beneath a pitched roof,” according to the city. You couldn’t build an apartment building or multi-unit condos here. 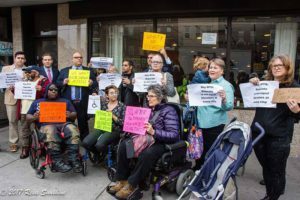 But a buyer could conceivably knock down the old building(s) and put up a more modern house in its place—something with a driveway, something that wasn’t 160 feet off the street and something that wasn’t built more than 200 years ago. Hi Henry, Good research. 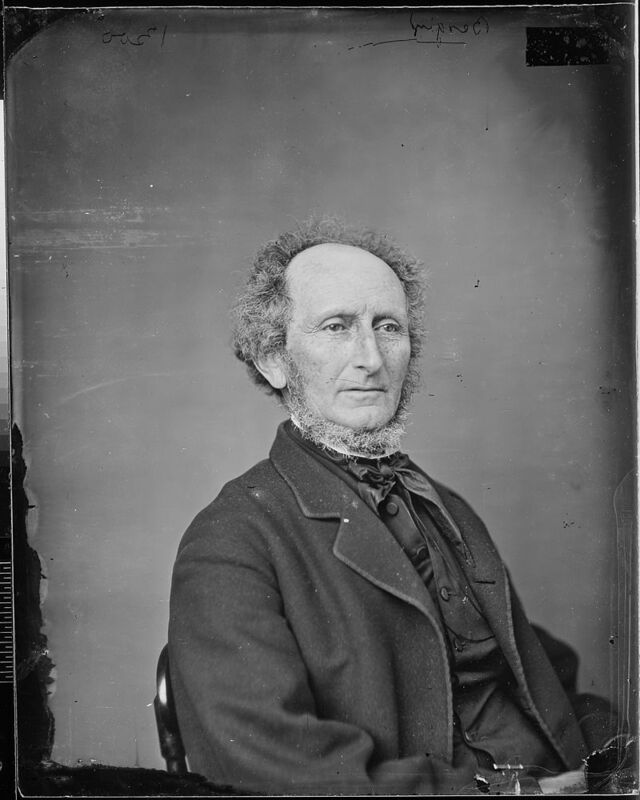 Just wanted to add that Teunis Bergen was the New Utrecht Town Supervisor in 1853, and presided over the meeting at the Yellow Hook schoolhouse when the resolution to rename Yellow Hook, Bay Ridge was passed and approved.